This information is complemented by the City of Boroondara Community Profile, which analyses demographics for the City and its suburbs based on results from the ABS Census. According to Council's forecasts, Boroondara's dwelling count will increase by 7,542 between 2018 and 2028, from 72,248 to 79,790. For more information on forecast dwelling growth, see population and dwellings on the Forecast .id website. In the 2016 Census, there were 69,419 private dwellings counted in Boroondara with 6,495 of these considered unoccupied. The main dwelling type in Boroondara is separate houses (54.4%), however, the amount of particular dwelling types varies across suburbs. For example, high density dwellings are more concentrated in Hawthorn and Hawthorn East, whereas Balwyn North, Deepdene and Ashburton have few or no high density dwellings, and relatively few medium density dwellings (see Table 1). Between the 2006 and 2016 Censuses, the proportion of dwellings that were separate houses decreased in Boroondara overall (-7.1%), a trend that also occurred across the Eastern Metropolitan Region (-4.3%) and Greater Melbourne (-5.1%). Population density increases with dwelling density, and suburbs with higher dwelling density have a higher population density (see Table 2). Table 3 shows the change in the number of separate houses and medium/high density for suburbs in Boroondara. All suburbs experienced an increase in medium/high density dwellings and a decrease in separate houses except for Balwyn/Deepdene, Canterbury, and Surrey Hills which recorded increases for both types of dwellings. Hawthorn had the highest increase in the number of medium/high density dwellings with an additional 2,537 medium/high density dwellings -built between 2006 and 2016. Hawthorn also recorded the highest loss of separate houses, losing 574 over this time. The next highest increase in medium/high density dwellings occurred in Kew (1,257 additional medium/high density dwellings), Camberwell (1,084 additional medium/high density dwellings), and Hawthorn East (957 additional medium/high density dwellings). Suburbs which had the highest loss of separate houses after Hawthorn were Hawthorn East (246 fewer separate houses), Kew (200 fewer separate houses) and Ashburton (124 fewer separate houses). Table 4 shows the breakdown of households in Boroondara by dwelling type. Similar to the proportions of dwelling types in Boroondara overall, around half of couples without children households were in separate houses (51.6%), 31.6% in medium density, and 16% in high density. In comparison, couples with children were most likely to live in separate houses (77.7%), and lone person and group households (that is a household consisting of two or more unrelated people where all persons are aged 15 years and over and there are no reported couple relationships, parent-child relationships or other blood relationships in these households), were more likely to live in medium and high density dwellings (66% and 71% respectively lived in medium or high density dwellings). Non-private dwellings are dwellings which are not self-contained and therefore provide a communal form of accommodation. In 2016, 140 non-private dwellings housing 4,765 people were counted in the City of Boroondara. The two most common types were hostels for the disabled (30 dwellings), and accommodation for the retired or aged (29 dwellings). Non-private dwelling types that had the highest residential populations were accommodation for the retired or aged (not self-contained) (1,441 residents in 29 dwellings), nursing homes (711 residents in 16 dwellings), and residential college, hall of residence (649 residents in three dwellings). The City of Boroondara has very low numbers of social housing stock. The Department of Health and Human Services reported that in June 2017 there were 782 social housing dwellings in Boroondara which represents approximately 1.1% of all Boroondara dwellings, compared to 1.9% of all Eastern Metropolitan Region dwellings. According to the 2016 Census, the municipality is ranked 71 out of 79 Victorian Local Government Areas for residents in social housing accommodation (with rank 1 having the highest proportion of residents in social housing). Due to the low provision of social housing stock, there are extensive waiting lists for social housing. The Office of Housing March 2018 waiting lists for the Box Hill Regional Office (covering the cities of Boroondara, Whitehorse and Manningham), show 1,749 people waiting for social housing and an additional 292 people waiting to transfer to more suitable housing within the social housing system. Consumer Affairs Victoria defines rooming houses as a ‘building where one or more rooms are available to rent, and four or more people in total can occupy those rooms’. Rooming houses must be registered with the local council and meet minimum health and safety standards. In June 2018, there were 16 registered rooming houses in Boroondara, eight of these had between 1 and 10 rooms, five had between 21 to 35 rooms, and three had more than 35 rooms. The Department of Health and Human Services defines Supported Residential Services (SRS) as privately operated businesses that provide accommodation and support for Victorians who need help with everyday activities. Each SRS determines the services it offers and its fee structure. In May 2018 there were six SRSs operating in Boroondara. In the 2016-17 financial year, 1,753 new dwellings were approved in Boroondara. Of these around one quarter were houses (25.4%) and three quarters were other residential dwellings such as semi-detached, row or terrace houses or townhouses, and flats, units or apartments (74.4%). Table 7 shows that between 2012-13 and 2016-17, dwelling approvals in Boroondara for new houses remained fairly stable averaging 507 approvals per year. However, approvals for new other residential dwellings increased steadily from 1,019 in 2012-13 to 1,272 in 2014-15 before falling sharply in 2015-16 to 610. However in 2016-17, approvals for other residential buildings were back in line with the longer term upwards trend with 1,304 approvals. Median weekly rents in Boroondara for all dwelling types are higher than the metropolitan Melbourne median (see Table 8). Rental costs between Melbourne and Boroondara widen as dwellings increase in size, and a four-bedroom house in Boroondara costs almost double that of Melbourne overall ($850 weekly rent per week compared to $440 per week). The Department of Health and Human Services reported that in the December Quarter 2017 there were no affordable dwellings available in Boroondara for families receiving a Centrelink payment. 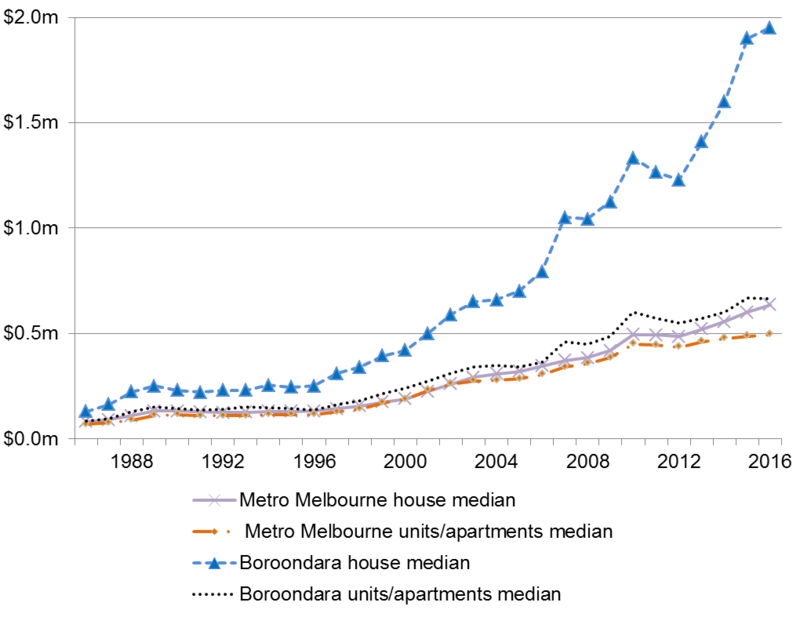 Figure 1 shows the median price for houses and units/apartments for Boroondara and metropolitan Melbourne between 1986 and 2016. In 2016, the median house price in Boroondara was $1.96 million, compared to $635,000 in metropolitan Melbourne and units/apartments in Boroondara were $665,000 compared to $494,000 in metropolitan Melbourne. Over this period, house prices in Boroondara have increased from a median price that was 57% higher than the metropolitan Melbourne median ($129,000 compared to $82,000), to being 207% higher in 2016. Median prices for units/apartments in Boroondara and metropolitan Melbourne have increased at a similar pace. The number of people in Boroondara who were homeless on Census night increased from 383 in 2011, to 426 in 2016. This was the second largest increase (11.2%) in the Eastern Metropolitan Region (EMR). Table 9 shows homelessness counts across the EMR and Table 10 shows homelessness counts for the different types of homelessness in Boroondara. These homelessness counts are likely to underestimate homelessness because having no access to accommodation can present a range of barriers to completing a Census form. However, the increase aligns with the increase in reports to Council relating to instances of homelessness, with 76 reports made in 2017 compared to seven in 2009. It is important to note that each report to Council may not indicate a single incidence of homelessness, as multiple reports can be received for any one location. For more information, email Research or contact Council.